The rehabilitation goals following amputation are highly variable. Younger patients universally want to regain ambulatory status and frequently return to work. Elderly patients with significant comorbid conditions may remain wheelchair-bound, and much of their rehabilitation is focused on providing wheelchair access in their living situations and working on independent transfers. It is important to understand that amputation in an elderly patient is frequently an event that occurs near the end of life. For these people, relief of pain and provision for modest function may be the most appropriate outcome in the limited amount of time they have left. The rehabilitation strategy for a young lower extremity amputee is aggressive and straightforward. Eventual ambulation is the rule rather than the exception. The use of rigid dressings and immediate postoperative prostheses has reduced the interval from operation to the beginning of ambulation to 1 month. Patients are instructed in the use of a compressive garment (stump shrinker) to control edema and are taught massage techniques to soften the scar and decrease its sensitivity. A temporary prosthesis allows gait training. The rehabilitation strategy for older amputees is much different. Only half of elderly patients undergoing amputation are considered rehabilitation candidates. Because of delays in wound healing, the mean time from amputation to prosthetic fitting averages 9 months. Although up to 80% of patients considered candidates for rehabilitation are fitted with a prosthesis, only one-third are ambulatory outside the home. At 2 years, only two-thirds of the ambulatory patients who initially walk remain ambulatory (primarily as a result of contralateral limb disease or cardiopulmonary restrictions). Therefore, independent ambulation after major limb amputation in an elderly vascular patient is the exception rather than the rule. The rehabilitation of a major upper extremity amputee is more complicated. Most of these patients are young, since trauma is the most common reason for upper extremity amputation. Loss of an upper extremity has greater functional impact on the patient. In addition, the psychologic effects are frequently more severe. For example, the highest suicide rate for amputees in the Vietnam War was reported in those with major upper extremity loss. The variety of functions performed in daily activities using the upper extremity is far greater than for the lower extremity. Effective prostheses for upper extremity amputees utilizing neuromuscular feedback are currently available. However, owing to cost and cosmesis, up to one-third of upper extremity amputees do not wear the prosthesis at all and a larger number wear their prostheses only intermittently. Finally, because of the traumatic etiology for most major upper extremity amputations, the incidence of postamputation pain syndromes is greater than in patients with major lower limb loss. The length of the residual limb correlates well with regaining the ability to walk. Cardiopulmonary disease and physical weakness make walking an overwhelming effort for some patients; this emphasizes the importance of preserving as long a residual limb as possible, so that walking will require the least possible amount of energy. The patellar tendon-bearing prosthesis is used for 90% of lower extremity amputees. It provides total contact with the residual limb, avoiding excessive pressure in any one area. A cuff suspension strap above the knee maintains close contact between the limb and prosthesis. The solid ankle cushion heel (SACH) prosthesis, the most frequently prescribed foot used for transfemoral and transtibial prostheses, is rugged and adequately simulates ankle motion at heel-strike and toe-off. It is a good initial foot even for the younger, more athletic individual who may go on to a newer, dynamic energy-storing foot after becoming accustomed to the SACH foot. The most commonly prescribed transfemoral prosthesis is the total-contact suction socket. For older, dysvascular amputees, a single-axis constant friction knee or single-axis “stabilizing” (friction lock) knee is best because it is lightweight. Younger, more athletic transfemoral amputees can tolerate heavier prostheses with hydraulic or pneumatic knees, which permit changes in cadence. More efficient prostheses requiring less energy are constantly being developed. 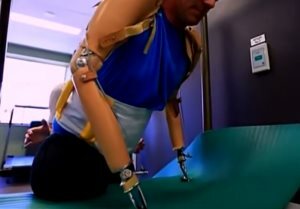 Components fashioned from new types of plastics, fiberglass casting tapes, and carbon fiber polymers allow construction of ultra-lightweight strong and durable prostheses. They are useful both in elderly amputees (who have less energy reserve) and in young amputees who want to participate in sports. The gait of both transfemoral and transtibial amputees is markedly different from normal gait. The forward velocity of walking is significantly lower in amputees and is lower in transfemoral than transtibial amputees. The time-distance parameters of velocity, cadence, strike length, and gait cycle are 1 SD below normal in transtibial amputees and 2 SD below normal in transfemoral amputees. The normal symmetry of walking is not present, as has been documented by measurements of single-limb support time and motion analyses. Patients who have undergone amputation require periodic checks of the prosthesis and residual limb, physical therapy, and in many cases psychologic support for life. Shrinkage of the residual limb requires replacement of the initial prosthesis after about 6 months and again 1 year after amputation. Thereafter, well-made transtibial prostheses should have a useful life of approximately 2 years. Patients must be educated to care for the residual limb, with utmost attention to cleanliness, and shown how to protect areas of pressure, trauma, or insensitivity. After amputation for vascular disease or complications of diabetes, symptoms in the opposite leg should be anticipated and reported promptly, and ulcers or other changes in the residual limb should be brought to the attention of the physician as early as possible.